Mechanics, Factories, Loading Docks, Festivals, Restaurant Patios, Gyms & More! This unit will cool up to 70 sqm of floor area. This unit will cool up to 270 sqm of floor area. This unit will cool up to 390 sqm of floor area. 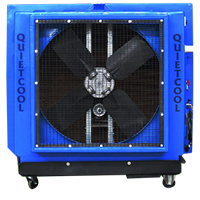 QuietCool: THE ONLY PORTABLE EVAPORATIVE COOLER THAT DELIVERS!!! 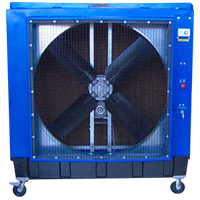 The Quiet Cool Portable Evaporative Cooler is for your work place, warehouse and factory, commercial industrial cooling. 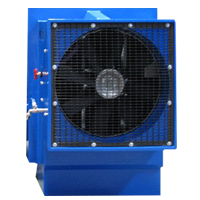 It cools large hot areas far more effectively than regular fans and costs far less than air conditioning. Cooler air means cooler work area and in turn, a happier and more productive staff. Cooler livestock equates to stress-free livestock, which can give better product results. Cooler greenhouses promote increased growth and profits, plus its insurance against damaged crops.